The following comes from Mantua Township and the fire department. Five trash trucks, two pick-up trucks and one car was damaged (Sid Marks/Special to The Sun). At approximately 4 a.m. this morning there was fire at our Public Works Facility behind the police department on Main Street. 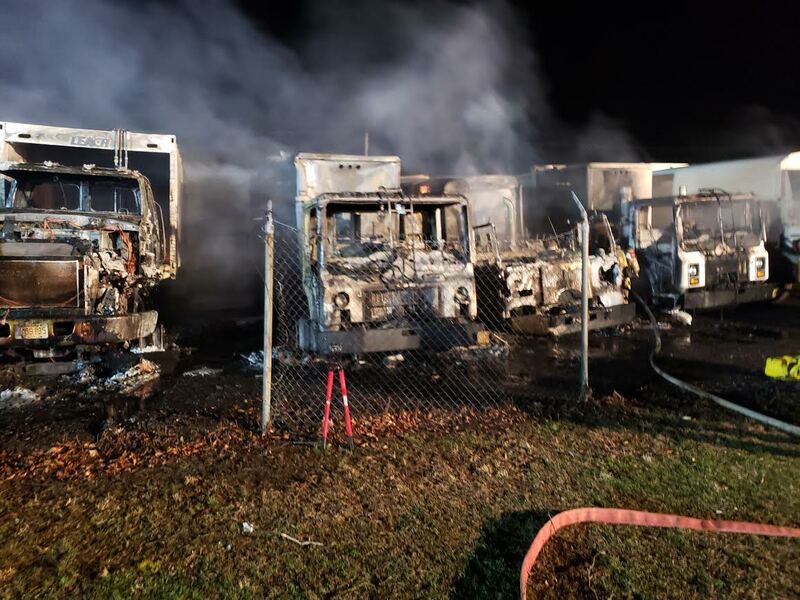 Unfortunately, five of our trash trucks caught fire, and were destroyed. Mutual aid was supplied by Pitman, Wenonah, Woodbury Heights, Woodbury and Washington Township fire departments. The fire appears to be non-suspicious in nature, however, it is under investigation by the appropriate authorities. No one was injured. We ask our residents to please be cognizant of these circumstances, when it comes to trash and recycling removal during the upcoming week, etc. You may experience some delays, but please understand that we are working toward a solution due to these emergent circumstances. Superintendent of Public Works, Steve Alexander, added neighboring municipalities Westville, Monroe and Logan have lent hydraulic trucks and manpower for the township to use. Other areas have lent out help out assistance, if needed. More rental trucks are expected to be added to the fleet. Please continue to move forward with placing your trash and recycling curbside on your normal “trash day,” and understand that there could be delays.